After learning he’d been named to the American Football Coaches Association (AFCA)/NAIA All-America First Team, Demarco Prewitt (JR/Menifee, Calif.)’s immediately placed a call another All-American. Prewitt was joined on the AFCA/NAIA list by teammate Shaq Bradford (JR/San Diego, Calif.), a junior defensive end, who earned Second Team honors. 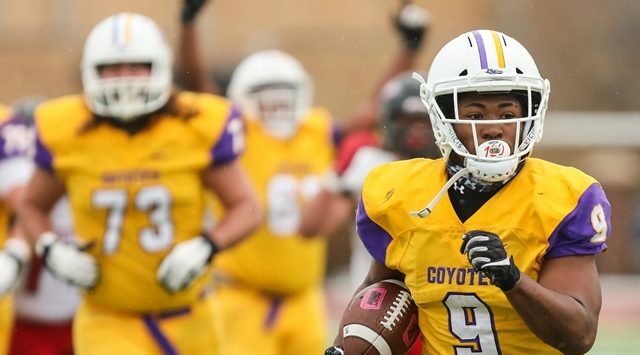 Four Coyotes also were named to the Associated Press’ Small College All-America Team First Team – Prewitt, Bradford, junior left tackle Eli Smith (JR/Severy, Kan.) and sophomore tight end Charlie Simmons (SO/Saint Johns, Fla.). Wesleyan compiled a school-best 13-1 record this fall, including a 10-0 slate in the Kansas Conference, won its first two NAIA playoffs games – the first postseason wins in school history – and became the first KCAC team to advance to the semifinals. The Coyotes were fourth in the final NAIA coaches poll released earlier this week. Drinkall said the All-America awards are reflective of the team’s success. Prewitt led the NAIA in rushing yards with 2,371 and rushing touchdowns with 38. He also led the nation in scoring with 41 total touchdowns. Prewitt played fullback his sophomore season and said the experience paid dividends this fall. As he did throughout the season, Prewitt credited the offensive line for allowing him to break loose. The Coyotes’ offensive balance also was a key factor. Junior quarterback Johnny Feauto (JR/Boulder, Colo.) threw for 3,273 yards and 41 touchdowns, preventing teams from crowding the line of scrimmage in an attempt to slow Prewitt. Bradford, who stands 5-feet-10 and weighs 219 pounds, was virtually unstoppable with his hiccup-quick initial burst and relentless pursuit. Bradford lost nearly 80 pounds to get ready for the season. “My body has completely changed from me being 300 pounds to about 220,” he said. “And just the way the system is has made me feel like a completely different person. Bradford was so driven that he routinely headed for the weight room for a workout session after playing a game. “A lot of people were like ‘I’m not doing that after a game,'” he said. “After every game I would go work out and get all the lactic acid out of my body. You’ve got to do things people aren’t doing and that’s thing I pride myself on doing after each game. The 6-8 Smith, who initially came to KWU to play basketball, anchored the line on an offense that averaged 48 points and 495 yards. Simmons caught 57 passes for 1,037 yards and 13 touchdowns in his first season as a tight end after playing wide receiver his freshman year. “The thing I can say about Shaq and Prewitt is that they practice as hard as they play a game and they show up every single day and they’re just as consistent as you can possibly be,” Drinkall said. “They handle themselves like professionals at all times. “Eli Smith is in the same boat. He’s shown up here and done everything perfect for the duration of his career. Drinkall marvels at the Coyotes’ historic offensive production. Drinkall says 2018’s success was not a fluke, but there’s work to be done. “There’s no doubt we’re among the best, but we still have that next hurdle to get over where we’re playing in those (championship) games,” he said. “When you talk about elite teams there are two kinds that play in those games – those that play and those that win. The postseason run gave Wesleyan players and coaches first-hand experience and knowledge of what it takes to win a national title. “I think it was really good exposure for our guys to get in a situation like that – not only the game, but the wear of the season,” Drinkall said. “That’s a long, long, long season. We played football an extra month past everybody else.